My first three layouts featuring my incredibly cute grandson. I present to you bold and fun, earthy and lively, soft and sweet. We will now have moodboard challenges instead of the sketches. Here is my take on our first board. This month we have the pleasure of playing with the irresistible "Blue Fern Studios Autumn Anthology". These papers are gorgeous with beautiful outdoorsy graphics and deep rich colors. 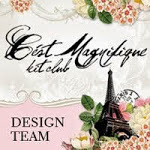 The kits has so many wonderful goodies to create a wide variety of layouts and ATC's. I am in love with this kit! For this layout I started with a splash mask and modeling paste. I infused my paste with the Blue Bubble paint. Once it dried I came back over the splashed with the blue paint to accent them and outlined it all in navy blue marker. The picture is double matted with tag cards, doily and ribbon creating more interest. The key crown chippie and hearts received a coat of gesso followed by a light brushing of the Mango Milk paste. Finally I came back in with my paints to highlight the splashes, created a floral arrangement with the chippie and added a few micro beads. I will be presenting a monthly one layout three ways feature. This is the third level. I used the main kit, Mixed media kit and the Flower add-on. Stash items: Micro beads, stencil and modeling paste. I love this month's chippies! This is a picture of my grandson's playgroup. I used a flower stamp and the embossing powder on the blue paper. So delicate and lovely isn't it! I applied a light coat of gesso on the chippies then used the embossing powder from the mixed media kit. 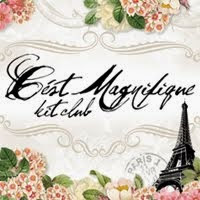 C'est Magnifique will also begin with a project life pages section. This series show what a fabulous time my daughter and I had in London England a couple of years ago. Can't wait to go back!! This kit has all the elements to make fun and interesting picture pockets! I look forward to creating my first album over the next twelve months. I hope you join me and share your projects with us on facebook! I used only the Main kit. Thank you for stopping by and taking I peek! Kathleen - Your layouts are all so gorgeous - as always! I love, love this kit and had so much fun with it too! Thanks for sharing and can't wait now for the layout 3 ways!